Tea is a very personal thing. Not only does everyone have exacting standards around their favourite brew, they also have very strong opinions about how everyone else should make theirs too. Whether you’re a milk first or last sort of person, a teabag or loose-leaf devotee, a three-spooner or a “get that stuff away from my cup” sort, we can all surely agree on one thing, and that’s that tea simply tastes better from a beautiful teapot. Not only is briefly introducing a teabag to a single mug of hot water and then throwing it away wasteful, it’s just not the best way to get a decent brew. And besides, even if you live or work alone and are in the habit of making a single cup, you owe it to yourself to make that cup count. 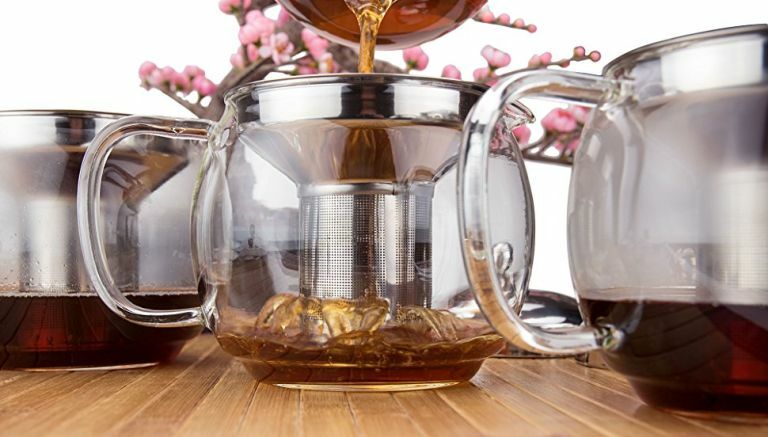 Glass teapots not only look great, they let you eye up your tea as it brews, so you won’t miss your optimum infusion. And if you frequently treat yourself to beautiful loose leaves and flowering teas, you’ll definitely want one. Classic ceramics in subtle or punchy colours are a traditional choice, and will keep your black and pu-erh teas up to temperature even if you get distracted by choosing the perfect biscuit to go with them (we’ve all been there). After that, it’s really all about design. If you like a bit of variety, go for one with a removable infuser basket for making loose-leaf and bagged teas. If you’re making big rounds, go for one with the largest capacity you can find, while lone tea-drinkers surrounded by coffee enthusiasts can treat themselves to a bijou pot, or even a mad scientist-style single-cup tea maker. With its removable infuser and transparent glass body, this beautiful-looking teapot is a great all-rounder for teabags and loose-leaf tea alike. It’s most useful for making larger rounds from loose tea leaves, producing around four standard cups in one go, so it’s a perfect next step from the in-cup infuser for people who frequently entertain, or families of tea lovers. When the infuser is in, it fits snugly, and the delicate spout pours neatly. Lovely for everyday or for special teas. If you like the whimsy and wonder of the Aeropress, but don’t actually drink enough coffee to warrant one, we have great news: the Tea Maker from Aussie tea obsessives T2 does the same thing to your teabag or loose leaves. Simply fill it up, watch it brew to your preferred shade, place it over your cup, and press down gently to release. For single servings, this is a great, easier-to-clean alternative to an in-cup strainer, but as it’s not strictly a teapot, you’re better off with our first pick if you’re making tea for more than one. If you’re the only tea-drinker in your house, but still want a proper pot, this little wonder from For Life is a superb buy. Its removable strainer is incredibly fine, for brewing everything from slender Rooibos to chunkier Oolong, or even the odd Tetley, should the mood take you. Plus, it looks great: its flush-sitting lid is hinged for easy opening without burning your fingers, and the durable and beautiful ceramic body comes in a range of cheerful colours. This ceramic character teapot ticks all the boxes for tea-loving Star Wars fans, although we do think they missed a trick not calling him R2-Tea2. While not quite as big as the real thing, it’s a considerable-sized pot that makes three generous mugs, great for family mornings and entertaining your fellow aspiring Jedi. The ceramic construction keeps tea warm, but be careful with your fingers as you grip the handle to pour, because the main body gets very hot. This modern-looking teapot takes the ancient ritual of tea-making and brings it bang up to date with a contemporary design. Unusually, it’s tall rather than squat, and its clear glass gives you precise control over every infusion. We also love the basket infuser, which can be raised or lowered on a string: if you’re done steeping but don’t have time to serve just yet, raise it out of the water so your tea won’t overbrew. Very clever. If you liked our first glass pick but want something with a bit more edge, try this one. If you’re after a classic teapot with timeless appeal, this is the one. It’s made in the traditional shape that we all know and love, and built of fine stoneware for a durable, dishwasher-safe finish that’ll give you years of use and countless cups. The pour isn’t the best on our list, so you’ll need reasonably good aim, but as our budget buy coming in at an incredibly reasonable £12 RRP, it’s a really good shout for first-time buyers stocking up on reliable kitchenware.